Before you started playing hockey, you probably weren’t aware of the many features that are available in a hockey stick. After all, a stick is a stick, right? After you’ve practiced for a while and discovered your style of play, however, you find that nothing could be further from the truth. The different materials, lengths, flexibilities, grips, and other options makes choosing the right hockey stick a very significant decision. As with other equipment – like your skates – it’s important to get a feel for the different types of sticks before choosing one, so ask some players around the rink if you can try out their gear. There’s really no substitute for how a stick feels in your hands while you’re on the ice. Like most other types of sporting equipment, hockey sticks have evolved significantly over the years. Although the basic wood stick is still available, today’s modern hockey player has a wide range of choices in terms of the stick they use. These days hockey sticks are made from different types of materials and are constructed using many feature combinations, all designed to give the player an edge on the ice. Choosing the right hockey stick features for you will depend on your size, skating ability, position and personal preference. The stick you wind up with will depend in part on how much you are willing to pay for it. Hockey sticks range in price from under $20 to several hundred dollars. 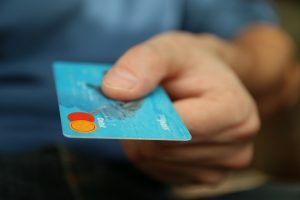 Allocate your budget based on your skill level, how much use the stick will get, and whether you need or want any high-tech features to improve your play. Be aware, though, that the price of the stick will not necessarily make you a better player! Setting a budget up front will help narrow the field for choosing the right hockey stick. Long gone are the days when all hockey sticks were made entirely of wood, even though they are still readily available and often favored by some very experienced “old school” players. In addition to wood, today’s sticks are made from fiberglass woven with carbon fiber, which are typically used by professional hockey players. Kevlar can also be added to the stick’s construction, increasing durability. Two-piece sticks are also available — these combine a shaft with a replaceable head and make it easier and less expensive to replace a broken stick. Like golf clubs, hockey sticks are made in right-handed and left-handed configurations. Interestingly, many normally right-handed players use left-handed hockey sticks because they feel it provides more power when shooting (about 70% of all NHL players use left-handed sticks). Once again, it’s what you feel most comfortable with. Generally speaking, if you hit a baseball with a right-handed stance, you should probably start out with a right-handed hockey stick, and vice versa. As a rule of thumb, if you’re standing on the ice wearing skates and holding the stick directly in front of you with the tip resting on the ice, the end of the grip should reach somewhere between your chin and your nose. If it’s below your chin, it’s on the short side; if it’s above your nose, it’s on the long side. Choosing the right hockey stick length, as with all of these features, is once again a matter of preference — there really is no right or wrong. A longer stick will allow you to reach for the puck when it’s way out in front of you. Some players find that a shorter stick gives them better and more precise control of the puck by keeping it close while they’re skating. Stick length is also often suggested based on the position that you play. Shaft flex is how much a hockey stick bends. The flex of the stick will affect the speed of a shot and is typically measured by an index number that represents the amount of weight (in pounds) required to bend the stick one inch. So a stick with a flex rating of 35 would be a lot more flexible than a stick with a rating of 100. Generally speaking, larger and more experienced players select sticks with higher flex ratings. The kickpoint is the location on the stick where it flexes when taking a shot. Traditionally, most hockey sticks were designed with a mid kickpoint. Recently, however, the low kickpoint stick was introduced in order to minimize the “wind up” that a player must take before taking a shot. The low kickpoint stick theoretically gives the experienced player a few extra milliseconds to take the shot. Choosing the right hockey stick kickpoint for a beginner means going with the mid kickpoint and possibly changing as you become more experienced. Although new variations are always evolving, there are three basic configurations of the curve of a hockey stick blade: heel, mid, and toe. The heel curve is more pronounced at the back of the blade (the part closest to the player). The mid curve is apparent in the middle of the blade. A blade with a toe curve bends on the part of the blade that is away from the player. Each blade configuration results in different aspects of shooting and stick control. 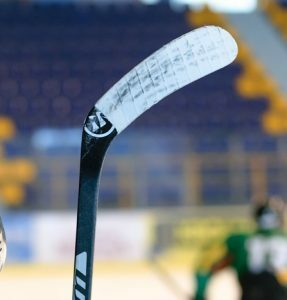 Since the mid curve blade is by far the most popular, for the beginning ice hockey player it probably makes sense to start there and experiment with other blade configurations as the skill level increases. The grip on a hockey stick is largely decided by how a player prefers to use the stick. Many players constantly slide their hands up and down on the stick, depending on the action, their skating, and what they are doing in relation to the puck. These players typically use a stick without a grip, despite the fact that the stick can often get slippery when it’s wet. To prevent slippery sticks, some players prefer a stick with a non-slip grip that is added during the manufacturing process or applied after the stick has been made. The lie angle of the stick refers to the angle of the shaft when the blade is flat on the ice. It is typically described as a number between 4 and 7. A stick with a lie 7 is more upright than a lie 4. The proper lie angle for a player is determined by height (taller players typically use a higher lie) and also by skating style and position. As an example, a player who spends a lot of time skating with the puck way out in front would probably prefer a lower lie angle. 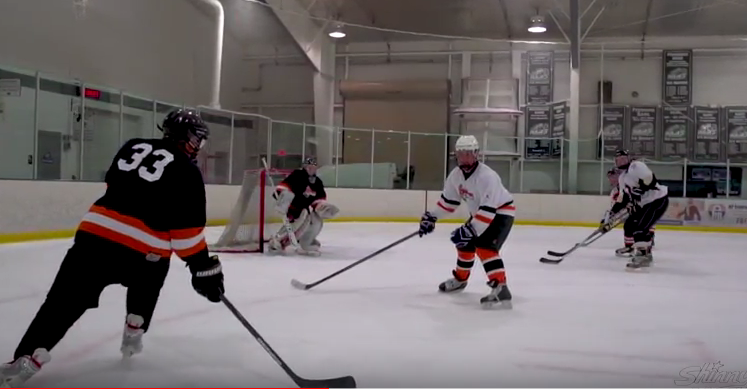 For beginning hockey players, it’s generally a good idea to start with a lie 5 and experiment from there. Hopefully you’ve gained some valuable insight for choosing the right hockey stick and are ready to purchase a stick and get on the ice! 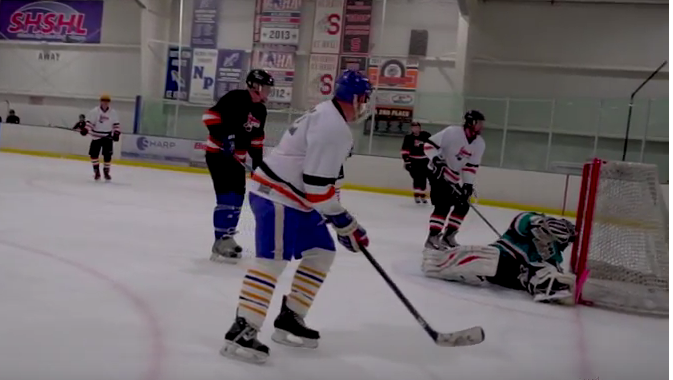 Whether you’ve been playing ice hockey since you were 12 or you’re just looking for a fast and exciting way to get into shape, Shinny USA is the place to be! 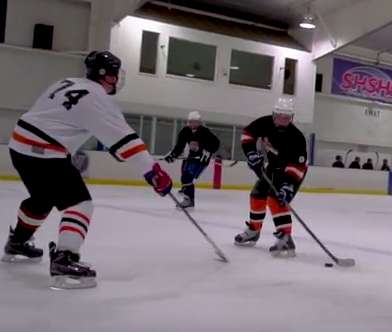 We have room for players of all abilities, and you can find us in the greater Philadelphia area at local rinks almost every day of the week. Sign up here to get started so you can get out on the ice ASAP. Or call us for more information. We’re looking forward to meeting you!